Etched brass kit. Kit 4C44 is for the diagram 109 Push-Pull Composite of 1909 of which ten were built. During Brighton days they ran as single cars, or as 'sandwich' , one either side of the loco on branch and local services. Motive power was Terrier 0-6-0T or D1 0-4-2T, later D3, H or M7 0-4-4T were used. Between 1924 and 1925 S.R. coupled them briefly to Diagram 198 Thirds before these went into electric sets. They were replaced by a mixture of LSWR 48ft Thirds (4C3) and LBSCR 48ft Thirds and the push-pulls were converted to vacuum braking. 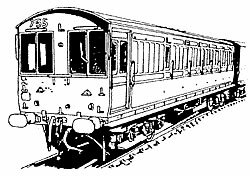 In 1931 / 1932 the 48ft trailers were withdrawn and replaced by 54ft Trailers converted from LBSCR overhead electric driving trailers (Kit 4C45). These car units appeared all over S.R., but particularly in the ex. LBSCR and SECR areas. The first set was withdrawn in 1938 but the last ran until 1959. Now supplied with our all metal bogies.